Autumn is that time of the year when all Bengalis (also known as Bongs) head over to their respective hometowns in the eastern state of West Bengal in India. 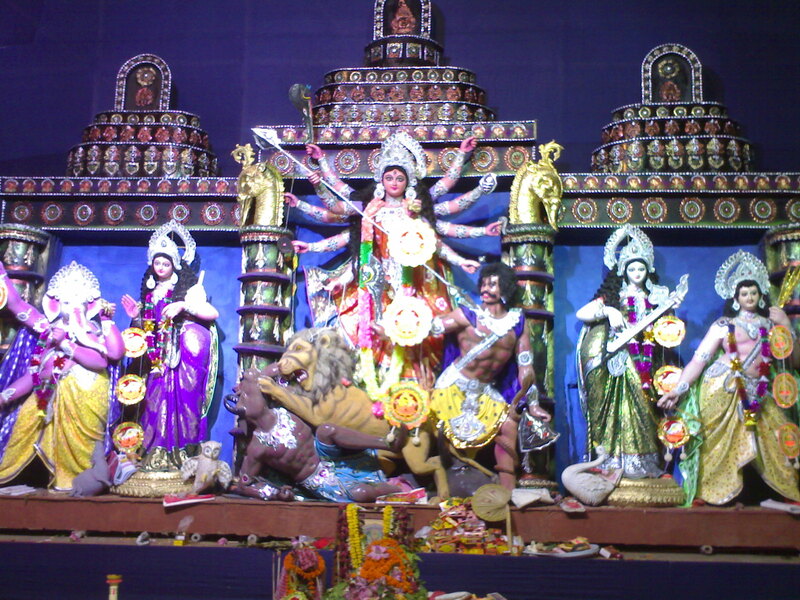 And the reason for this mass homecoming is the festival season triggered off by the greatest festival for the Bengalis, Durga Puja, the worship of the mother goddess Durga who symbolizes the triumph of good over evil. This is the time of reuniting with family and friends and great food, fun and frolic for the duration of the 4 day celebration. Being a bong myself I could not afford to miss to celebrate this festive season with my family and thus set off with my wife Haimanti, to my home town Durgapur, a small township 158 Kms from Calcutta, the capital of West Bengal. Air travel being too expensive we settled for the Train, which would take a little more than 36 hours for the 2000 Km long journey from Bangalore, where I live for my work. The reunion with my parents and my younger sister, who works for a publication firm in Delhi, the capital of India was great as this was the first time we all got together after my marriage last year. 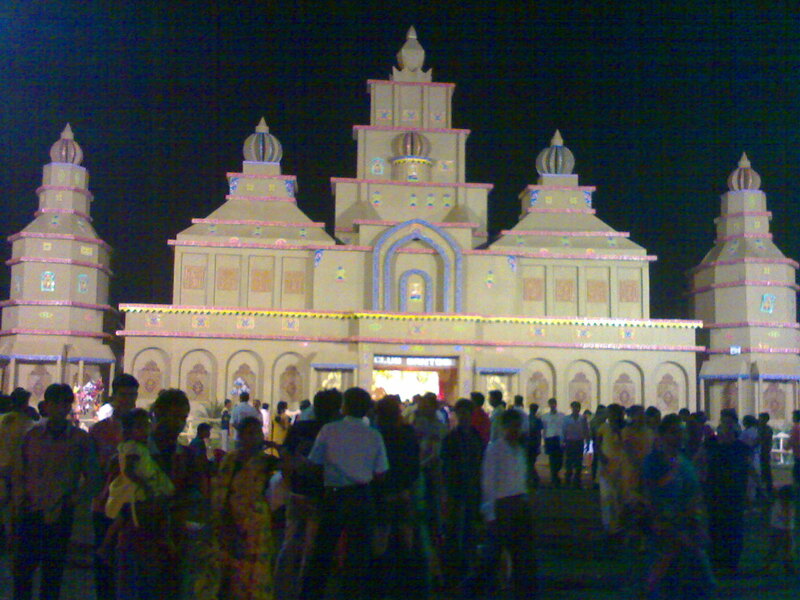 After a day of rest we decided to go out Pandal hopping in dad’s newly purchased car. 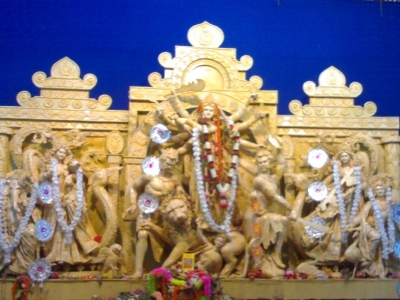 Now let me tell you a little more about the Durga Puja celebrations which generally takes place in the bengali month of Ashwin and according to suitable dates in the lunar calender. 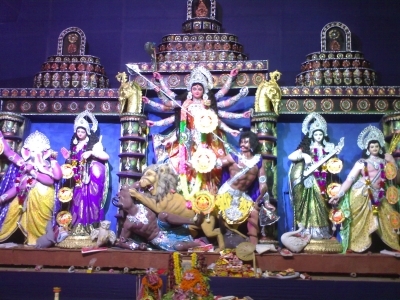 It is celebrated with pomp and festivities for the Maha Saptami(seventh), Maha Ashtami(eighth), Maha Navami(ninth) and the Dashami(tenth) day of Debi Pokkho (Fortnight of the goddess). It celebrates the return of goddess Durga from her husband, Lord Shiva‘s house in Mount Kailash to her parent’s house. Temporary tents called Pandals are erected at virtually every nook and corner and the idol of the goddess erected inside these tents and worshiped. 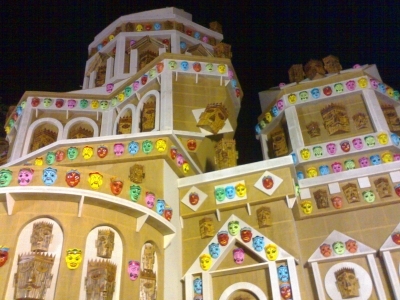 A sense of creative competition prevails as to which of these pandals and idols can ensnare the hearts of the worshippers and thus draw the maximum crowd. It is to see the creations and join the festivities that we set off that night. The 4 days of Durga Puja went by swiftly and we set off to Calcutta as we had to meet members of the family like my aunt who lives there and Dipankar who other than being a senior of mine from college is more like a brother to me. 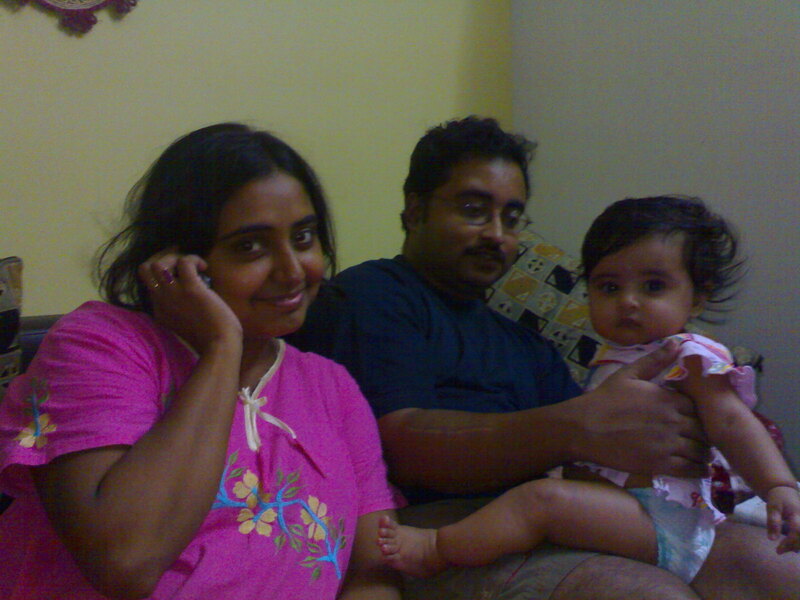 But this visit was not for Dipankar but his little daughter Roop Katha (Fairy Tale), all of 6 months old, whom I would be meeting for the first time. She is so lovely that we had a hard time bidding her goodbye. We had a scheduled flight back to Bangalore on the 17th October (Friday) but due to a “technical difficulty” on the flight, we were deplaned after we had already boarded. This prompted us to reschedule the flight to the 19th (Sunday) and explore some of the culinary delights that are my favourites and could not savour enough this time due to a packed schedule and thus a lack of time. We, the Bongs, literally live for food and the bengali cuisine, though rich in spices, is more a play on the finer senses of taste and smell and not overtly spicy. 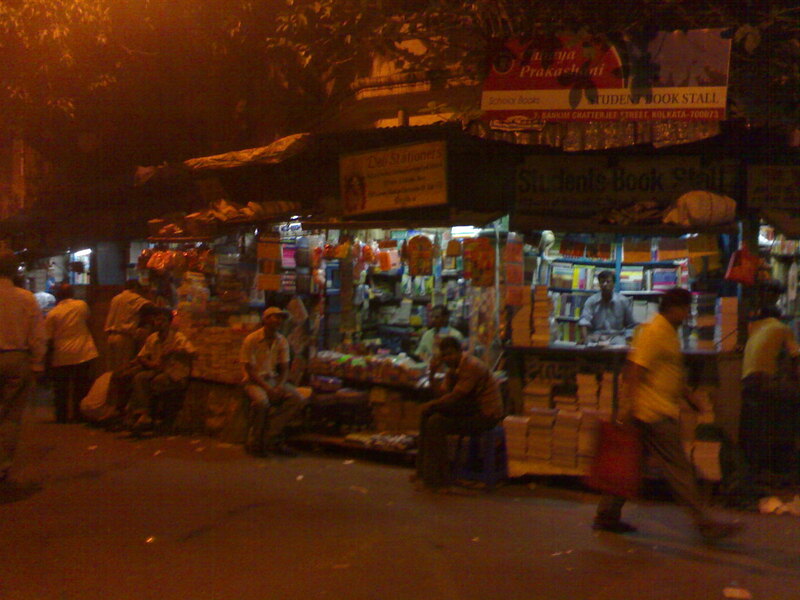 I set off with Dipankar’s wife, Rituparna, to College Street, which is virtually a book lover’s paradise. The whole of College Street is littered with book shops that offer, as the saying goes, every single book ever published on this planet. There we went to Paramount Cafe which is only serves and is famous for its different varieties of Sherbets. 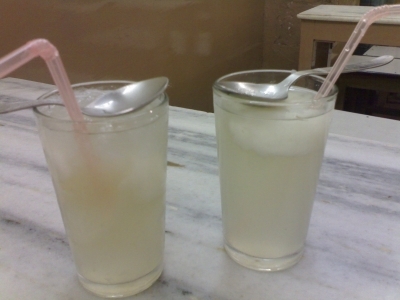 I tried the Daab Shorbot which is a finely scented drink made of tender coconut water and pulp and was delicious. Calcutta was the only city in India to have an underground metro rail service before the national capital New Delhi got one too. 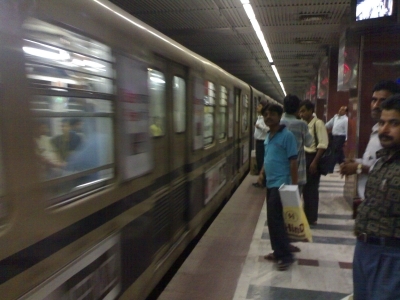 The metro serves as a very important mode of communication that’s cheap and fast and is the lifeline for a majority of all living in Calcutta. 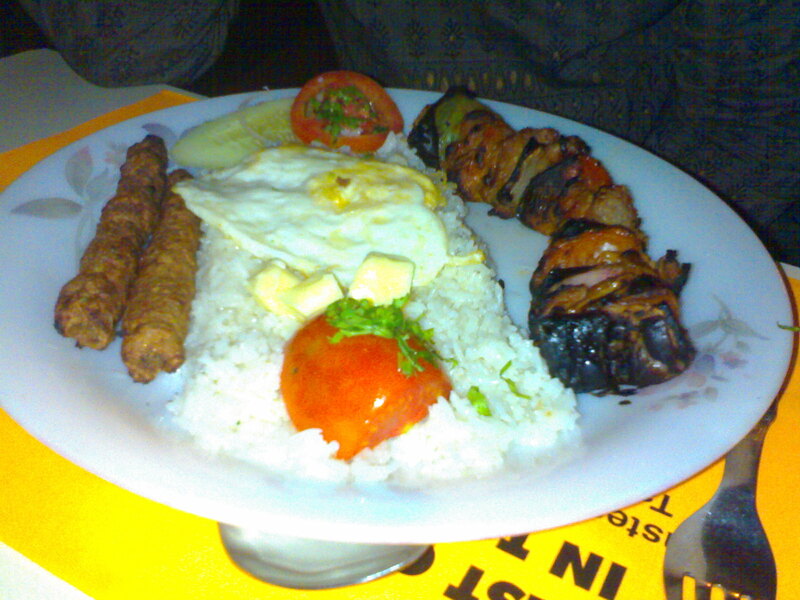 I took the Metro and landed at Peter Cat, a famous restaurant situated at Park Street famous for it’s Chello Kebap and I was not disappointed. Chello Kebap is made of either mutton or chicken cubes, diced and marinated with select spices and herbs and served with a poached egg and buttered rice. 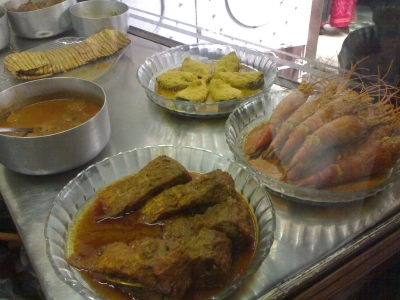 But I was missing one of the restaurants I definitely go to every time I visit Calcutta, Bhojohori Manna, which is known for its traditional bengali fare and I was not going to miss it this time as well. I settled down there to indulge my senses in Prawn Malai Curry (Prawn cooked in celicious coconut gravy), Daab Chingri (Jumbo prawns cooked in a mild mustard sauce steamed in a green coconut), Jhurjhure Aloo Bhaja (crispy potato juliens) and Kosha Mangsho (mutton cooked in a spicy and tangy, dry gravy) and got lost in their taste. But fret not, the links on the items above will direct you to their recipes. 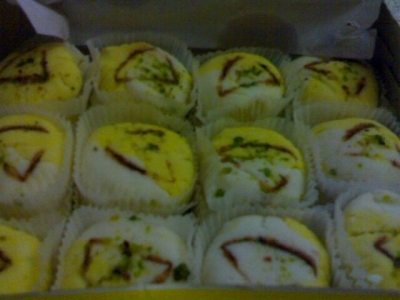 Having fulfilled my culinary desire it was time to take the flight back to Bangalore, but not before I picked up Sandesh (sweet made out of cottage cheese), which is exclusive to this part of the country and my friends in Bangalore just love it. After all we Bongs are most famous for our sweet tooth.